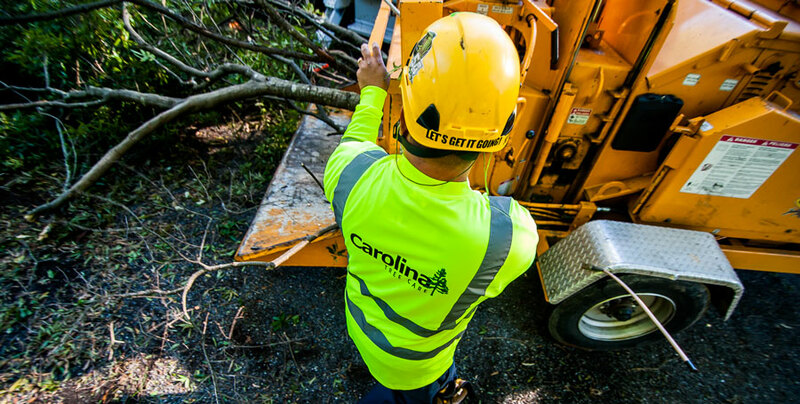 Carolina Tree Care has the knowledge, insurance coverage, equipment, and trained and experienced staff to meet all of your tree care needs. Our certified arborists will make sure your landscape is healthy and looking its best. At Carolina Tree Care, we serve a wide variety of commercial, industrial and retail properties including apartment complexes, homeowners associations, historic landmarks, corporate campuses and more. Whether we’re providing a pre- or post-construction consultation, clearing land for a site, assessing tree risks and property hazards, or diagnosing and treating diseased trees, we work hand-in-hand with property managers and real estate developers to enhance curb appeal and ensure the safety of your property. We understand that commercial sites with high vehicle and pedestrian traffic pose unique, and possibly complex, tree care challenges. We pay close attention to the public’s use of your site when designing and executing your tree care plan to minimize injury and property damage. And we act quickly to remove or provide better support when a tree is discovered to have a structural defect or any condition that could pose a high risk of failure. The removal of dead or dangerous trees should be a priority for every property owner. Eliminating deadwood, removing dangerous branches, and correctly pruning young trees are all important to minimize hazards to property and people. These services should only be rendered by trained and experienced technicians to reduce potential injury to people and damage to property. Headquartered in Concord, NC, we proudly offer commercial tree trimming services to businesses across the Charlotte, Greensboro, Raleigh, Durham and Winston-Salem greater metropolitan areas.